Creating is an innate ability; it draws men to the mechanics of a car or the intricacies of woodworking. Still, no one can deny the fact that you need the right tool for a task or project. This is an honest Porter cable scroll saw review that should help you figure out if it is the best scroll saw for beginners. The Porter cable scroll saw is meant for detailed, curved cutting. The scrolling motion gives it the ability to create smooth curves or add smaller details to the wood piece being cut. Still, all tools have pros and cons, and the following will highlight those. The light is not too bright, which does not help visibility. Wattage is a little low, meaning power can be severely diminished when sawing a piece that is a little tough. The motor has a stutter at low speeds, which could make smooth-cutting difficult. The noise is a bit of an issue but does settle down at high speeds. Using it is not always simple due to its lack of mobility. It is only natural to have questions about the Porter cable scroll saw, and the following are just five of the most common questions associated with this particular scroll saw. 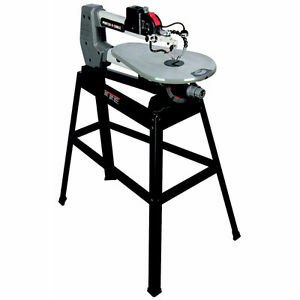 Q — What is the size of the table that comes with the Porter cable scroll saw? A- — The size is about 20 inches by 12-5/8 inches. Q — What is the tool’s throat depth? A- — You are looking at about 18 inches. Q — Does this particular scroll saw tilt both ways? A- — The simple answer is that it does tilt but herein lies the issue. The table can tilt 45 degrees to the left, which is standard, but it does not do the same when tilting to the right. It only tilts 15 degrees to the right. Q — What is the size of the motor? A- — The saw is particularly small, and it cannot handle heavy jobs, which explains the reason why the motor is only 1.6 amp. Q — Can the Porter cable scroll saw take both pinned and pinless blades? A- — The Porter cable scroll saw does have the ability to use both pinned or pinless blades, which makes it quite versatile. There is no doubt that the Porter cable scroll saw has a few shortcomings, but it is not meant to tackle all jobs. The price of the scroll is reasonable, and you can add more detail to your wood piece in ways that other scroll saws cannot provide. Its range may not be wide, but it can prove to be useful, especially for beginners who are not tackling bigger jobs just yet.